I swear half the questions that land in my inbox is about how can you organize your quilting area. I think every creative person struggles with organization. The downside of that is if we don't maintain a little bit of organization we can go nuts looks for what we need to finish our quilted project. Today, we are going to talk about how we can organize our individual projects to keep all those pieces together. Few people have the ability to cut all your fabric, sew all the pieces into quilt blocks, and put all those blocks back into a quilt and when our furry friends or little buddies show up in our sewing studios those pieces have a way of getting scattered. I am cheap. OK, I'm not a total cheapskate but I do try to save money where I can so I can afford the fabrics and tools I want. So if I'm spending $100s of dollars on the newest fabric storage idea or cabinet organization I'm not going to be able to buy tons of fabric. The one thing I do spend money on is a good planner. One year I bought one of the $1 ones from Target Dollar Spot. It fell apart by May so then I had to try to keep track of the pages of my planner that was supposed to keep me organized. So now I spend a little money on one. My friend Becky Jorgeson has a planner just for quilters. She sent me a copy that I shared a video of on YouTube if you are interested. Other than my planner I'm cheaping out on everything else. I store my scraps in plastic shoe boxes. You can't beat them, they are less than a dollar a piece when you order them online. Block of the month projects are usually stored in scrapbook paper boxes they are the perfect size for 12 1/2" quilt blocks. When it comes to blocks larger than that I use extra large storage bags. I have to keep that stuff put up because my cat is a thief. He takes things and I don't know where he puts them. He has a rotary cutter in his stash. I watched him the other day jump up on Paul's workbench and take a polishing pad. Paul did find it in a trash can on the other side of the basement. But what about the actual parts when working on a quilt project? Well, I hit my local dollar store, you know the one where everything is a buck. In our area, it's Dollar Tree. So what did I grab? I got some cookie sheets, some magnets, and a couple of butterflies. I know if I make it pretty I will be more likely to use it. It takes just a few minutes with a hot glue gun. Just because we aren't spending a lot of money doesn't mean it can't be pretty. See I told you it was that easy. You don't have to put the butterflies on to your magnets but I just wanted to dress things up. Now that I have my fabric on my cookie sheets the magnets keep the fabric in place. I like the three pan system because I can keep one on the cutting mat, one by my machine, and one going between the machine and the pressing area. You, of course, can use more or less and for the price, you can have as many of these systems set up as you have projects going. 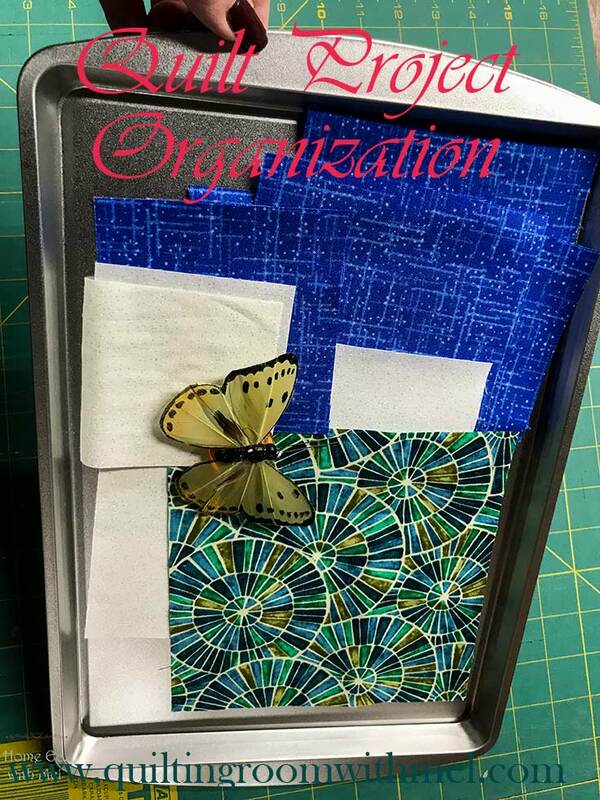 You could also have different things on your magnets to designate what they are, for example, butterflies for personal projects, birds for guild projects, and flowers for charity projects. The possibilities with this system are endless. For the set I showed in the video I spent $6.00 and I have a couple of magnets leftover. I could do three of these "systems" for under $20.00. That's cheap organization if you ask me. If I needed to store these for longer than the project I'm working on I could put them in a bag or I could wrap it with the press and seal stuff. I prefer press and seal over cling wrap because I fight cling wrap to no end. Sealing it up means no dust, I live on a gravel road dust comes in, no kitty hairs, and no missing pieces. 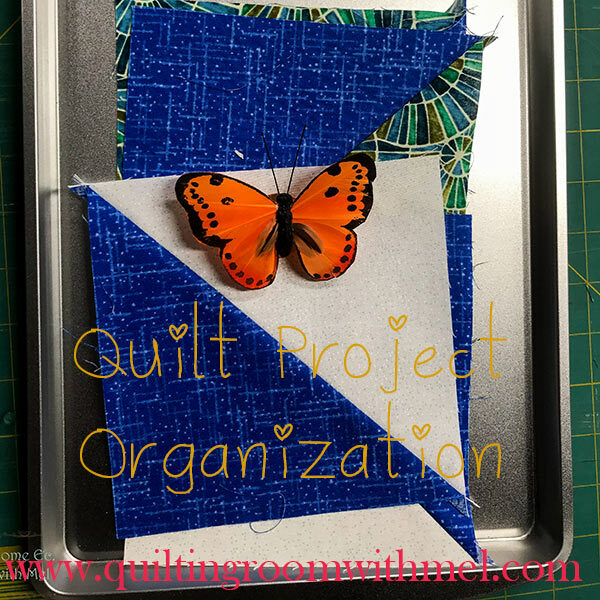 I really hope this helps you keep your quilting projects organized. If you need help getting your studio clean you might want to check out the 30-day craft room cleaning challenge. If you have more questions be sure to let me know. I'm always available to help where I can. You can also sign up for our newsletter below the pinable photo.